A smart tooling insert could improve productivity by carrying out in-process condition monitoring. The sensing device, developed by the Advanced Manufacturing Research Centre (AMRC) with funding from Innovate UK, will allow operators to monitor the condition of cutting tools without having to stop the machine for a manual inspection. In this way it could save both time and money, according to Hatim Laalej, AMRC Machining Group Technical Lead for Control Systems, Sensors and Data Acquisition. What’s more, operators will sometimes change a tool before the end of its life, in order to avoid damaging an expensive part if it does become worn, he said. 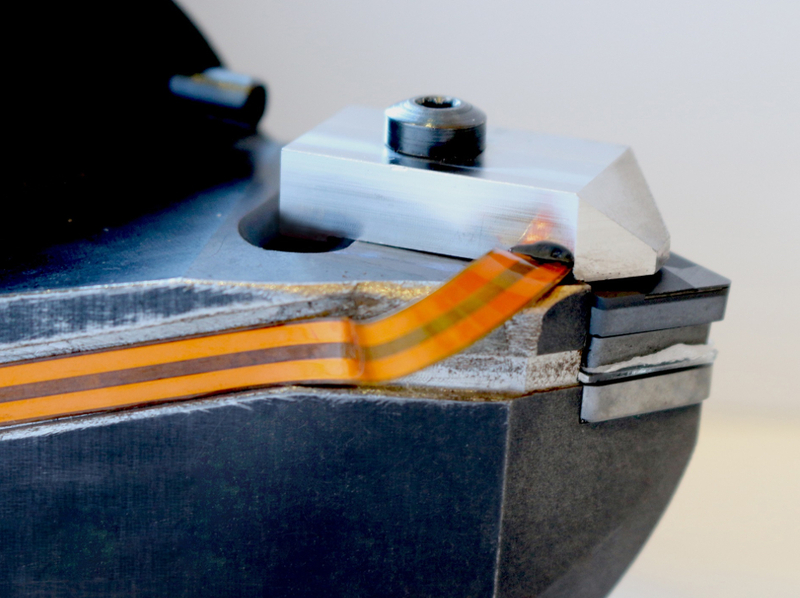 The prototype device, which uses low-cost electronics, is embedded with sensors that produce data about the current condition of the cutting tool. This data is then converted and sent wirelessly to the machine panel or the operator’s control pad, allowing them to determine the condition of the tool without stopping the machine. To embed the sensors into the tooling inserts, the team used lasers to etch a trench-like groove into the device. They then attempted to print sensors inside these trenches. However, when they tested the inserts during machining they found the printed sensors came off, as a result of the harsh environment of titanium cutting. “But when we cut the laser trench into a polycrystalline diamond cutting insert, it became conductive,” said Laalej. If the tool breaks it will break the circuit, immediately alerting the operator. The Innovate UK project was a collaboration between fellow High Value Manufacturing Catapult partner CPI, alongside Element Six, Advanced Manufacturing, BAE Systems, Printed Electronics, the National Physical Laboratory and DMG MORI. The AMRC is now hoping to convert the prototype into a commercial product. Cool! Oops, I meant hot!